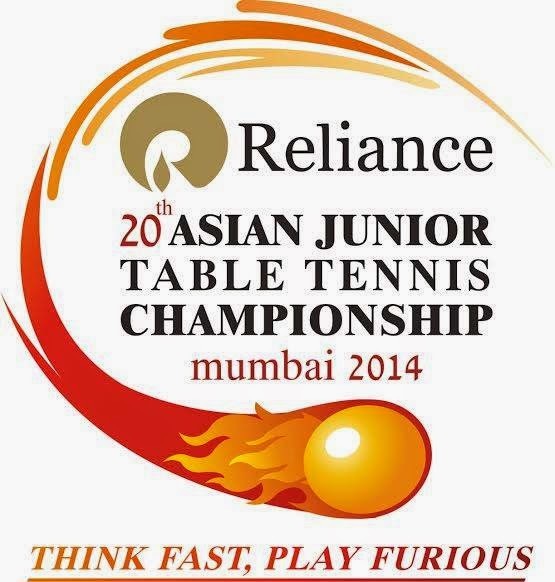 Three golds each for Manav Thakkar and Archana Kamath at the Table Tennis nationals being held at Rajahmundary. 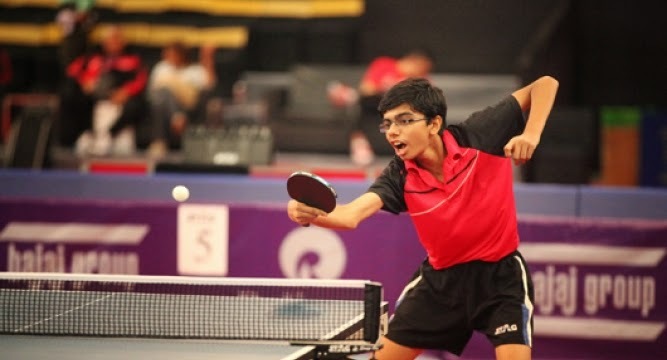 Manav Thakkar has totally dominated not only the domestic sub junior scene but also the Junior section. Manav's consistent and powerful backhand was the main weapon even though finalist Parth Virmani put up a very good fight. 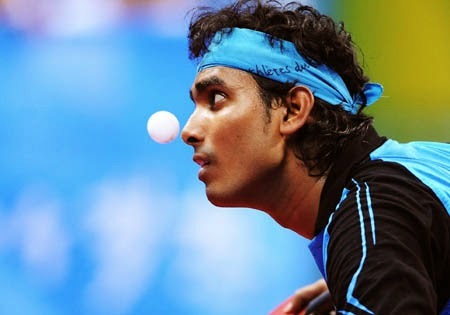 Parth had beaten Manav in the team events, in what was a big upset performance. Archana Kamath of Karnataka beat V Jaiswal to win the Sub Junior girls title at the Cadet and Sub Junior national championships that is taking place live at Rajahmundary. 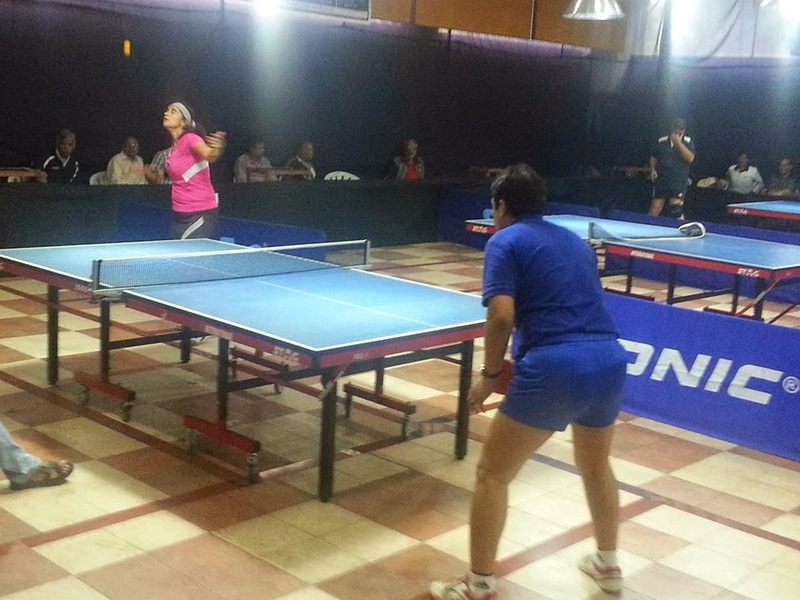 Archana beat a determined Varuni 4-2. It is wonderful to see ferocious attacking play displayed by young girls like Archana and now, Diya (Cadet girls). Acchhe din aayenge! 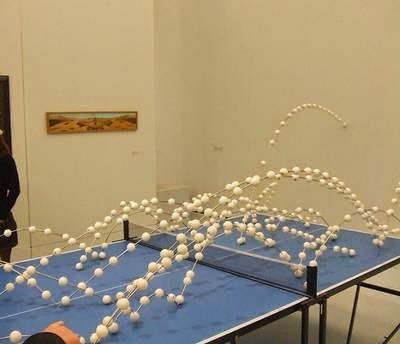 Studying the trajectory of Table Tennis balls. 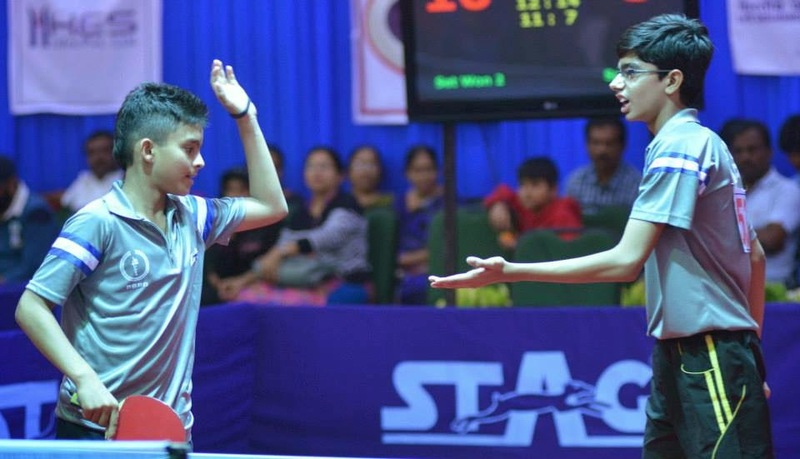 PSPBA won the Cadet and Sub junior boys titles, while Karnataka and Maharashtra A shared the corresponding girls titles at the Cadet and Sub Junior National Table Tennis Championships at Rajahmundary. While PSPBA won with their star players, the girls from Karnataka are continuing playing their role of turning around Karnataka TT's fortunes. The singles events will start and we'll need to watch this generation closely. Some of these players are almost sure to take India to higher levels in the years to come. Are pre-teens and teens taking over the world of Table Tennis? At the world level, you have Fan Zhendong, who started winning elite events before the age of 17. There is a new crop in China. 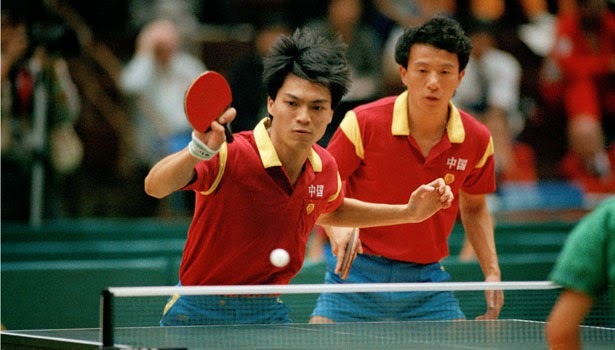 Yu Zhiyang, Liang Jingkun, have already beaten the very best. They just need to show consistency now. Yu has won the Asian and World Juniors in addition to a World Tour (formerly Pro tour) event. In Regional events, you see several youngsters beating seasoned players. 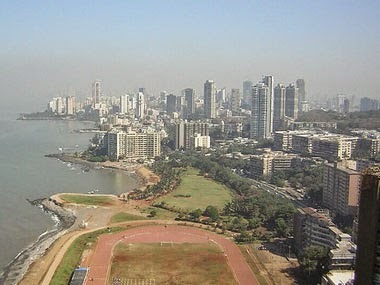 In India, we have several players in their teens and very early twenties. So what does this all mean? 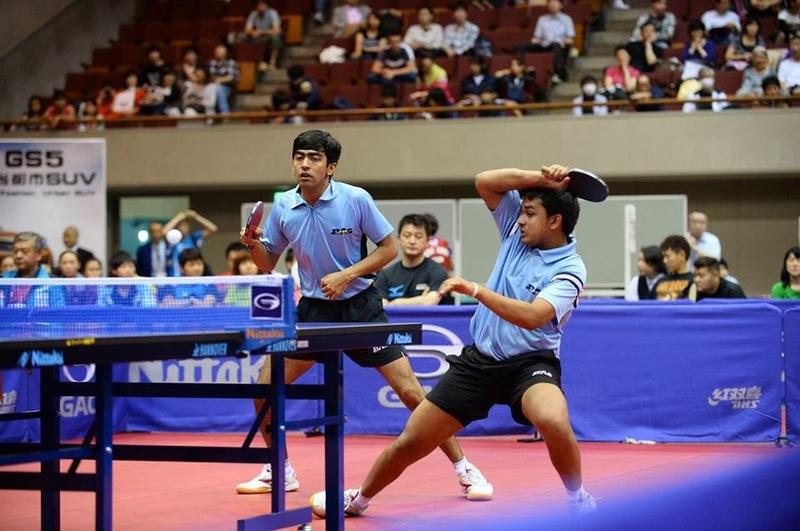 Table Tennis has become an extremely physical sports, where fitness is of prime importance. Coaches at the elite level now focus on using the whole body instead of just parts of the body. Is it time to change the rules? Definitely time to think! 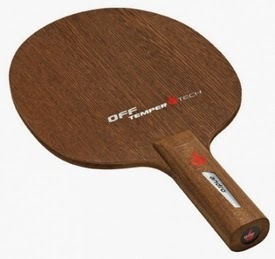 It is interesting to see Rasant Table Tennis rubber and the various versions of it such as Rasant, Rasant Powersponge, Rasant Powergrip, Rasant Grip, and so on. 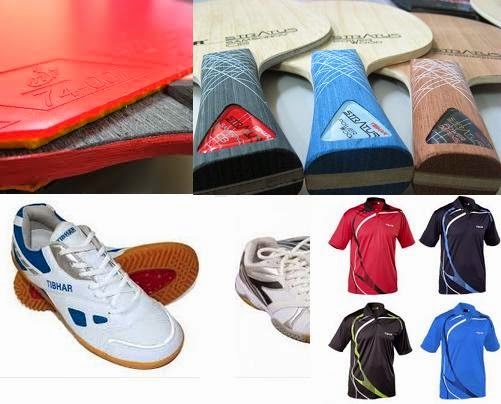 We feel these rubbers are good for Table Tennis players upto National or International level. The performance is impressive with good spin and speed. 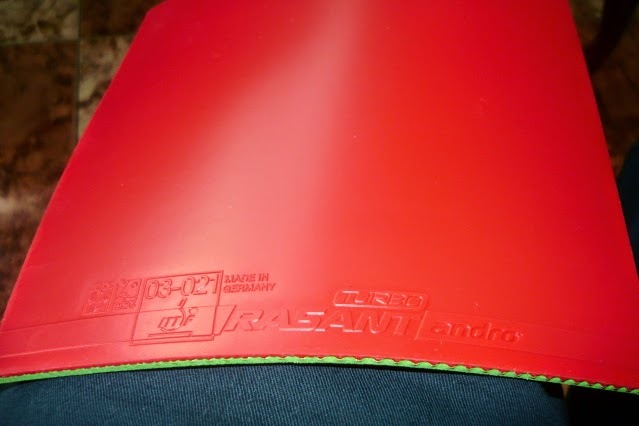 Control is very good for most of the versions of the Rasant series of rubbers. 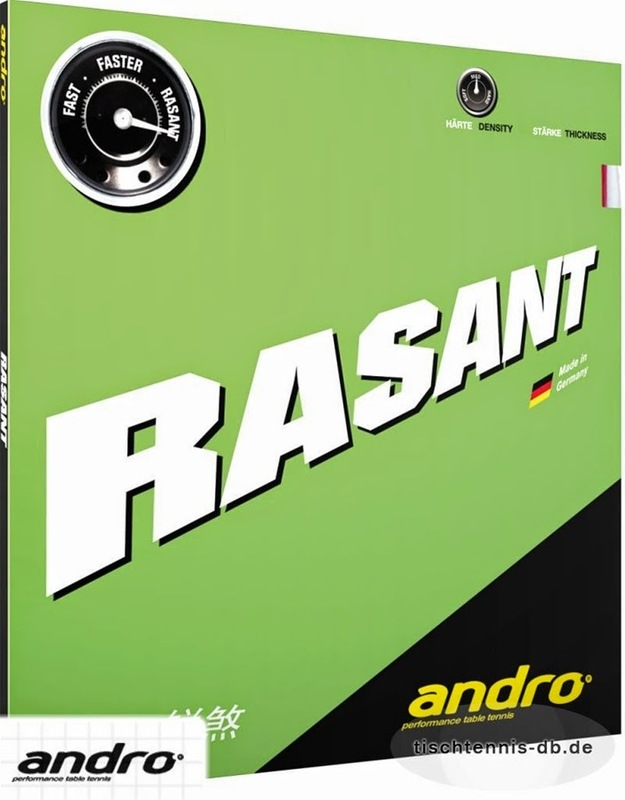 Andro launched the Rasant series with its attractive green sponge. 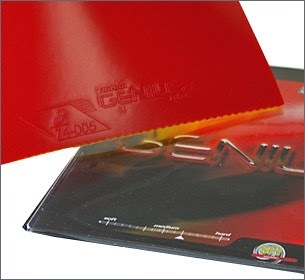 Since then, they have been working on improving the rubber with newer versions to suit the various styles of play. Message us at 09822749251 for more information. Birdie Boro beat team mate Manav Thakkar (India Junior Champion and India No. 1) in the finals of the CBSE nationals at the Emerald International School, Indore. Manav gave a tough fight to his mentor and close friend. They gave a thrilling display of their skills to the huge number of spectators gathered at the venue. Wang Manyu beat He Zhojia 4-2 (12:10, 11:6, 14:12, 6:11 and 12:10) to win the World Junior Girls Championship title. In the boy's finals, Yu Ziyang beat higher ranked Yuto Muramatsu 4-0. In the semi-finals, Yu beat team mate Liu Dingshou 4-1 while Yuto beat Xue Fei 4-0. Congratulations on your 3-1 (8:11, 11:7, 11:6, 11:9) win over the Legendary Kreanga recently at the European Champions League. Although you are stronger, a win such as this fills us with pride. Doing a great job for Borussia Düsseldorf along with Timo Boll and team. 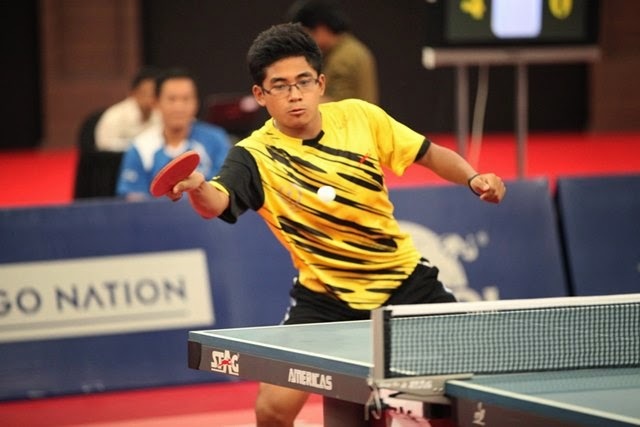 Who is the next Table Tennis star in the making? 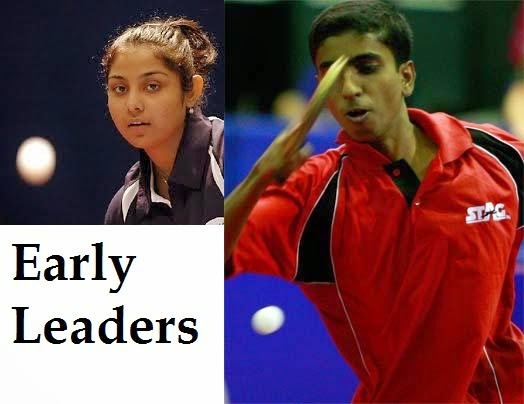 Manika Batra and Abhishek Yadav win the Youth National Championship titles at Allepey, Kerala to stake their claims as the Princess and Prince of Indian Table Tennis. While Manika beat surprise finalist, Charvi Kawle, Abhishek beat Sudhanshu Grover in the finals. 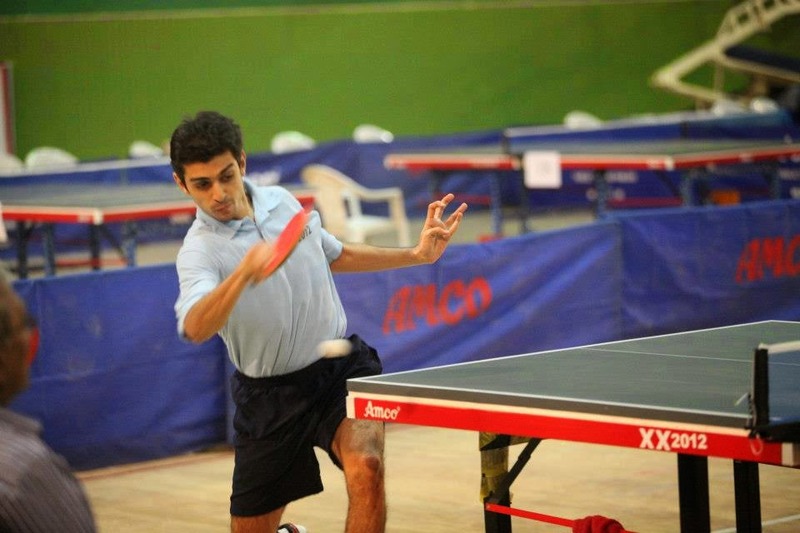 Manav Thakkar wins the Indian Junior National Championship at Allepey, Kerala! He is now no. 1 in both sub junior and junior categories. Congrats to the brightest Indian prodigy!! Unreal click of Utkarsh Gupta in action trying to retrieve an edge ball at the Central Zone National Ranking Table Tennis Tournament at Indore. Clicked by the enthusiastic Prasad Naik. The photograph has been hand picked to be published in the newspapers! The tournament is being held in the Abhay Prashal stadium and organized by Jayesh Acharya and his dynamic team. Great facilities, great hospitality. Table Tennis right from the heart. Most of the matches have reached the advanced stages. The semi finals and finals of the senior sections will be played tomorrow. Late Shree Pratap Vora Memorial Table Tennis tournaments at Mumbai. There are two tournaments at Kandivli- a 3 Star District Ranking with many events (Oct 1-3) and the Maharashtra Veterans State Ranking Tournament (Oct 4 and 5). Last date for entries is 28th September. Those who wish to participate, please hurry! Moon Moon Mukherjee vs Yogesh Desai at PYC, Pune. Team events. After a lot of speculation about the uncertainty surrounding India's participation at the Asian Games at Incheon, the team will go and the same team that participated in the Glasgow games has been retained. 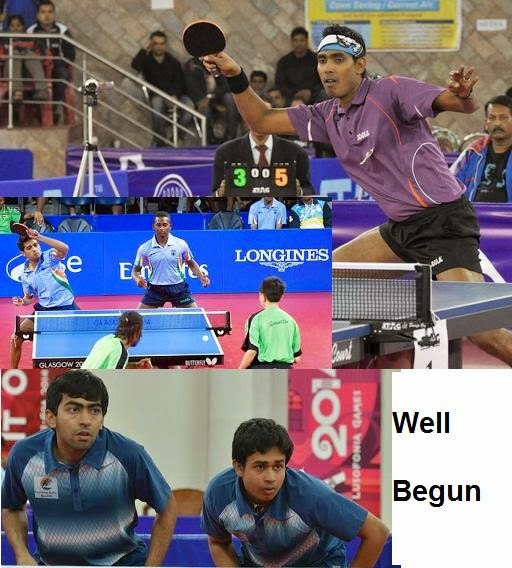 Men: A. Sharath Kamal, Soumyajit Ghosh, Harmeet Desai, Antony Amalraj and Sanil Shetty. 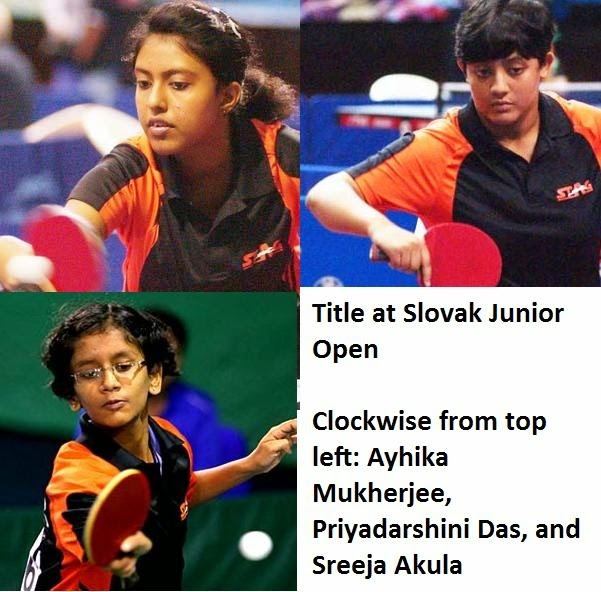 Women: Ankita Das, Madhurika Patkar, Poulomi Ghatak, Manika Batra and Neha Aggarwal. Coaches: Peter Engel and Bhawani Mukherjee. 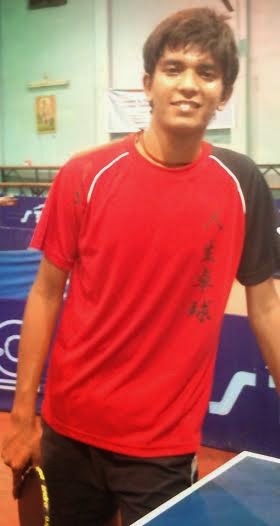 Liang Jingkun, who beat Zhang Jike and Ma Long playing in Mumbai! 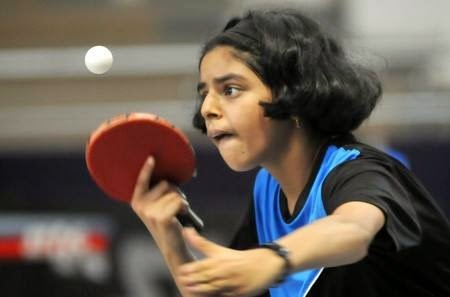 One of the players participating in the Asian Junior Table Tennis Championships at Mumbai. He has beaten World and Olympic Champion Zhang Jike and Ma Long in the Chinese trials! 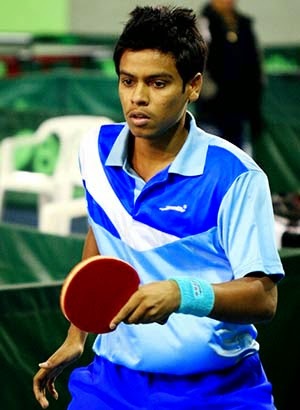 Abhishek played some long rallies and good shots at the Asian Junior TT Championships. He inaugurated the event. Coming soon! Will you be there? One of Asia's premier event featuring the World Class champions of the future. Right here in India's financial capital. Backed by some of the Blue Chip companies in India. 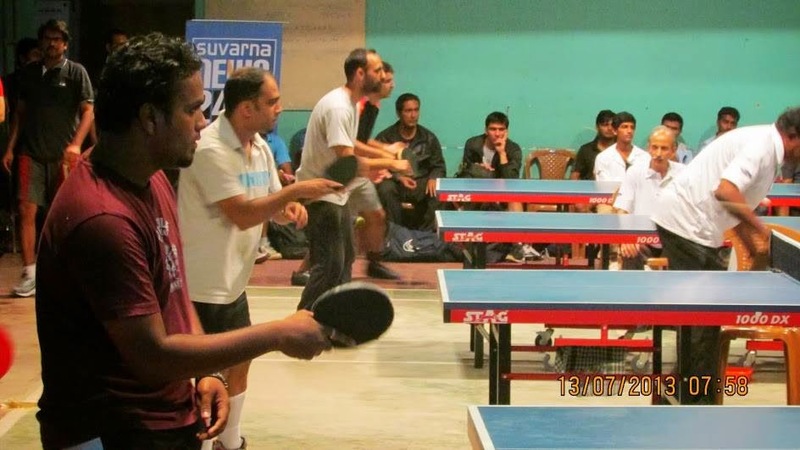 Poulomi Ghatak and G Sathiyan of PSPB won the prestigious Inter Institutional Table Tennis titles. 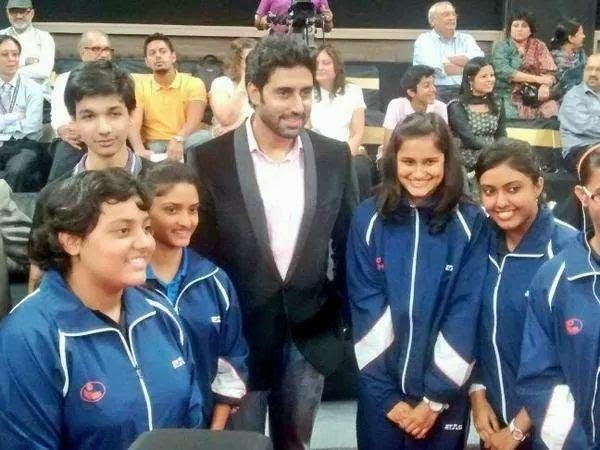 In the finals, they beat Soumyajit Ghosh and Pooja Sahasrabudhe respectively. The Inter Institutional Championships are the second most prestigious on the India circuit. All the performers here not only get a head start for the season, but also get 50% more points than the Zonals. Men (Final): G. Sathiyan (PSPB) bt Soumyajit Ghosh (PSPB) 4-2 (11-1, 6-11, 11-7, 11-9, 10-12, 11-9); Semifinals: Soumyajit Ghosh (PSPB) bt Sanil Shetty (PSPB) 4-0 (11-8, 11-6, 11-7, 12-10), G. Sathiyan (PSPB) bt Sarthak Gandhi (FCI) 11-8, 8-11, 11-5, 11-8, 11-7). Doubles (Final): G. Sathiyan/Sourav Saha (PSPB) bt Soumyajit Ghosh/Harmeet Desai (PSPB) 3-0 (11-7, 11-9, 11-9). Women (Final): Poulomi Ghatak (PSPB) bt Pooja Sahasrabudhe (PSPB) 4-2 (12-10, 9-11, 11-9, 13-11, 8-11, 11-8); Semifinals: Pooja Sahasrabudhe (PSPB) bt Mousumi Paul (PSPB) 4-2 (11-8, 9-11, 7-11, 11-3, 14-12, 11-6), Poulomi Ghatak (PSPB) bt Madhurika Patkar (RSPB) 4-3 (2-11, 12-10, 11-13, 5-11, 11-3, 11-6, 11-3). Thomas Lee, a famous name in the West Bengal Table Tennis left for the heavenly abodeon 15th August 2014. He was in a city nursing home and suffered an acute cerebral attack. He leaves behind his mother and sister. Lee was of Chinese origin, but was very popular for the support he gave to all the players that he came across. He was a top class player for his state and for Railways. 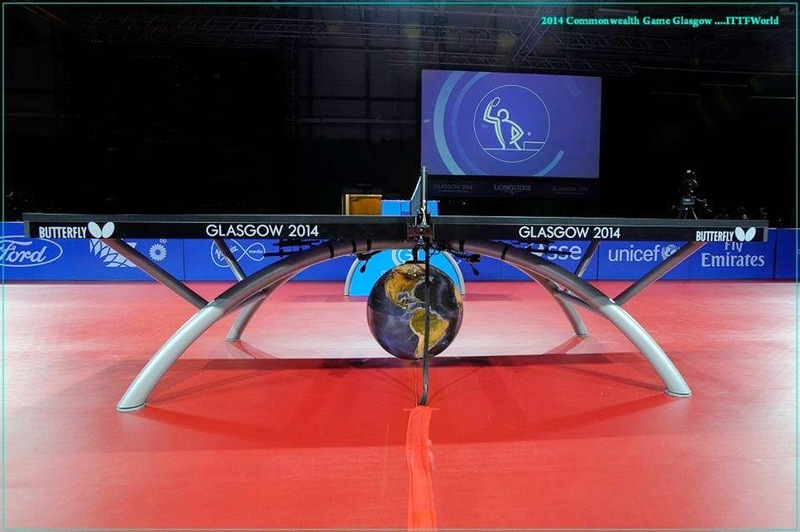 The beautiful Table Tennis tables that were used at the Commonwealth Games at Glasgow. The Malabar Hill 3 Star Table Tennis district tournament will be held under the aegis of the MCDTTA at Malabar Hill Club, Mumbai from 11th to 14th August. Mr. S S Gamre is the chief referee. Thanks to Deepak Sir for the information. We request you to please send info about tournaments in your region so that we can share with TT fans/players. 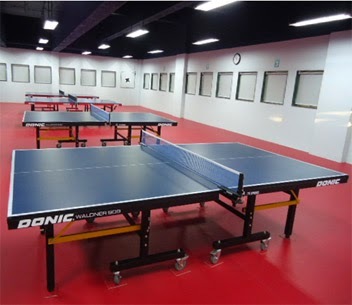 Photo: PYC Gymkhana Table Tennis hall. Dates are sometimes subject to change due to unavoidable circumstances. Please contact the organizers. 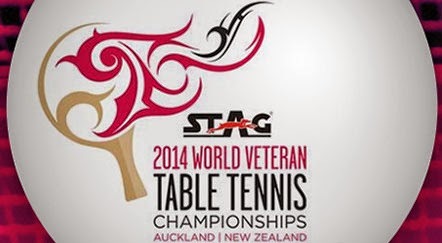 You can mail to editor@tabletennisbug.com in case you are unable to reach them. 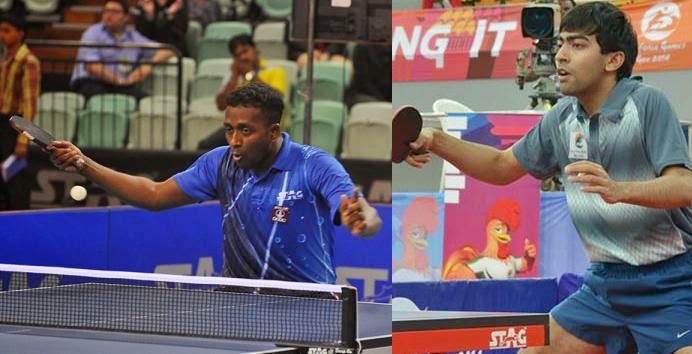 At the prestigious Commonwealth Games that have started at Glasgow, the Indian Men's Table Tennis team comfortably beat Vanuatu, N Ireland, and Guyana in their pool to advance. 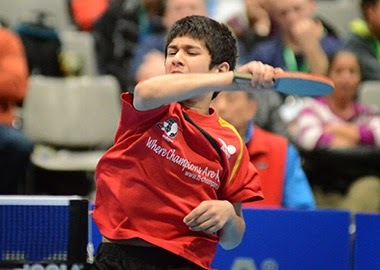 While the matches against Vanuatu and Guyana were a mere formality, Soumyajit had to battle back from 0-2 down against Robinson of N Ireland eventually winning 3-2. However, India blanked all the teams 3-0. Rakshith RB of MSSTTA and R Samyukta bagged the Junior girls and boys titles at the Kushal Nagar Karnataka State Ranking Table Tennis tournament. Both Rakshith and Samyukta conceded two games before prevailing over Vedanth M Urs and Kushi V.
R.B. Rakshith (MSSTTA) bt Vedanth M Urs (Vidyashram, Mysore) 11-8, 5-11, 10-12, 13-11, 14-12, 11-1. 11-3, 11-9, 11-8, 11-7, 9-11, 11-6. Excited at an opportunity to meet two of the biggest personalities who are changing the face of Table Tennis in India and the World. Peter Karlsson and Vivek Kohli of Stag International. Anirban Roy Choudhary beat Anshuman Roy in straight sets to bag the men's single crown at the Canara Union. 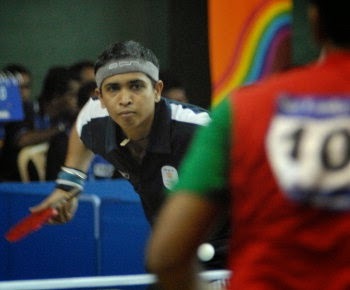 The event was the 1st Ranking Table Tennis tournament of the Karnataka Table Tennis season. Shwetha won the women's title. 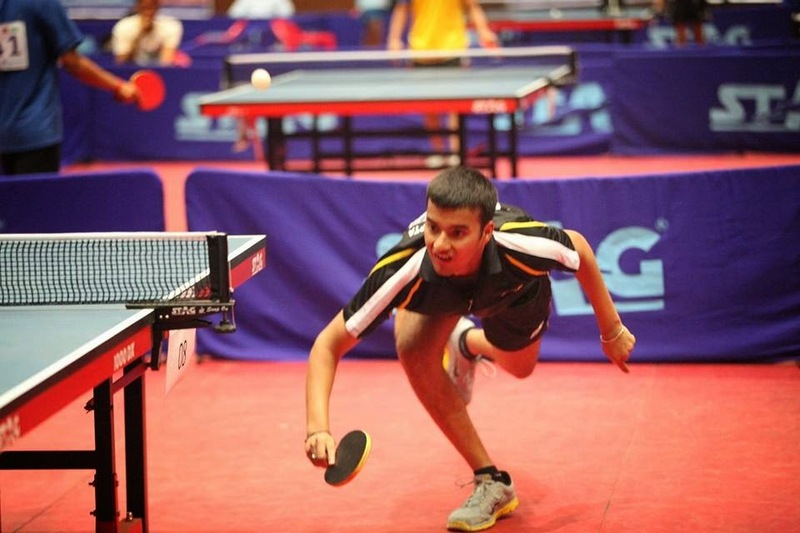 Shreyal Telang made a comeback to Table Tennis by winning the youth boys title, while Spoorthy MV won a creditable double. Men: Anirban Roy Choudhary bt Anshuman Roy 11-8, 12-10, 11-6, 11-5. Youth boys: Shreyal K Telang bt Akshay Mohanta 11-7, 11-8, 11-4, 6-11, 11-6. Junior boys: Rakshith RB bt Shreyas Kulkarni 11-8, 8-11, 11-6, 8-11, 11-3, 10-12, 11-6. Women: Shwetha bt Spoorthy 11-7, 11-8, 12-10, 13-11, 11-9. Youth girls: Spoorthy MV bt Kushi V 11-7, 11-9, 11-8, 5-11, 8-11, 12-14, 5-11. Junior girls: Spoorthy MV bt Gayathri Tankasali 11-6, 11-2, 11-6, 11-5. 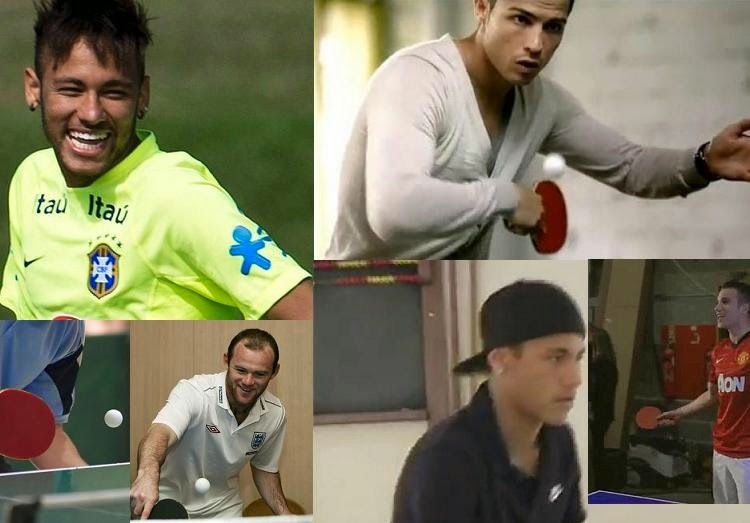 Neymar, Ronaldo, Rooney, Van Persie playing Table Tennis! Soccer players enjoy Table Tennis. Recently, Neymar was spotted playing a game, losing a bet and having to crawl under the table. But he did it all with great sporting spirit. A Amal Raj of India beat much higher ranked SEO Hyun Deok. It is worth noting that Hyun Deok has previously beaten World and Olympic Champion Zhang Jike a couple of years back. A great win for Amal Raj and one more step towards world class standards from Indian players. Another great achievement was when young Harmeet Desai lost a golden opportunity to beat Singapore legend Gao Ning, who was ranked in the World top 20 for several years. Harmeet was leading 3-1 and lost 4-3. 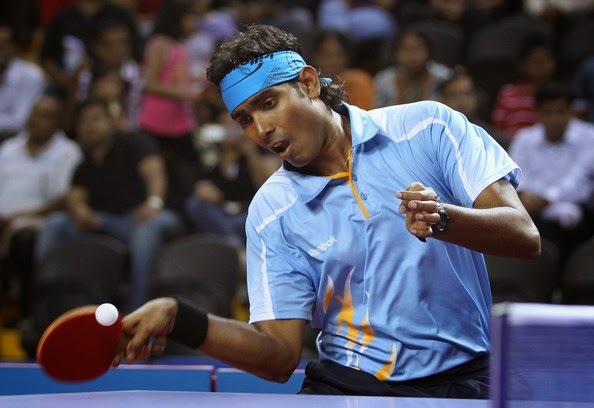 Four Indian Table Tennis players reached the Men's main draw. Amal Raj progressed the farthest. 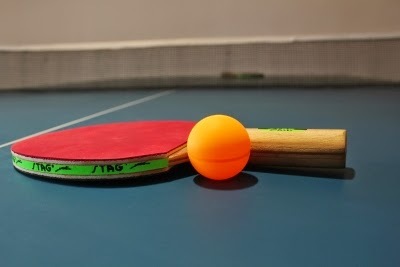 The Bhavnagar District Table Tennis Association (BDTTA) is organizing the 1st OPEN GUJARAT MAJOR RANKING TABLE TENNIS TOURNAMENT-2014 from 18 to 21 June 2014. The tournament is the first one in the 2014 series and is expected to attract huge participation. VENUE : Shri Krushnakumarsinhji Townhall, Motibag, Bhavnagar. 3) Karnataks 2012 State champion in team events. Best win against - Avik Das, Shubham Kundu, M Subhash, Jaideep Das, and Niloy Basak. 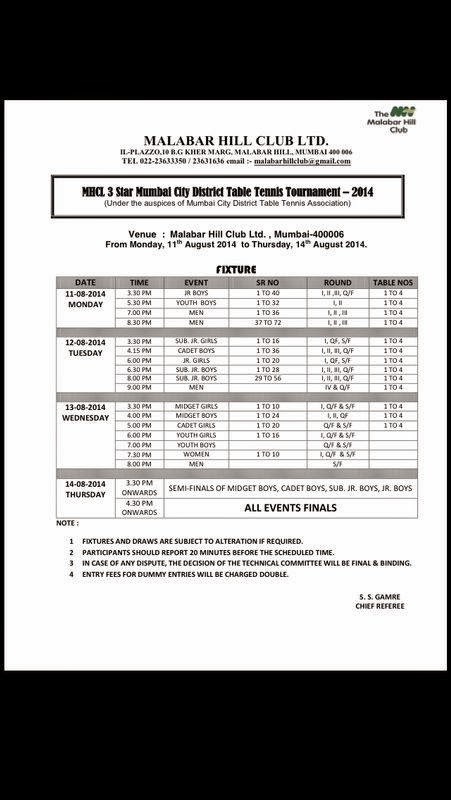 The Pro TT 4 Star Combined Mumbai District Ranking Table Tennis Tournament 2014 will be held from June 10-15 at the University Pavilion, Marine Lines, Mumbai. Mr. Mahendra Chiplunkar is the organizing secretary of the tournament. The tournament will have competitions in 18 categories subject to a minimum of eight entries in any event. Entries close on June 05, 2014. The event is expected to attract good participation since it is early in the season and is a time for students with no academic pressures. 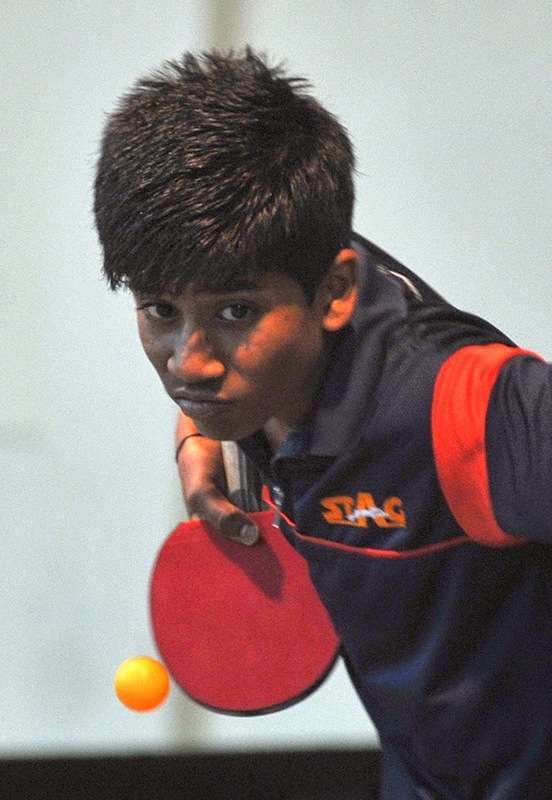 Karnataka is seeing a revival in Table Tennis achievements. 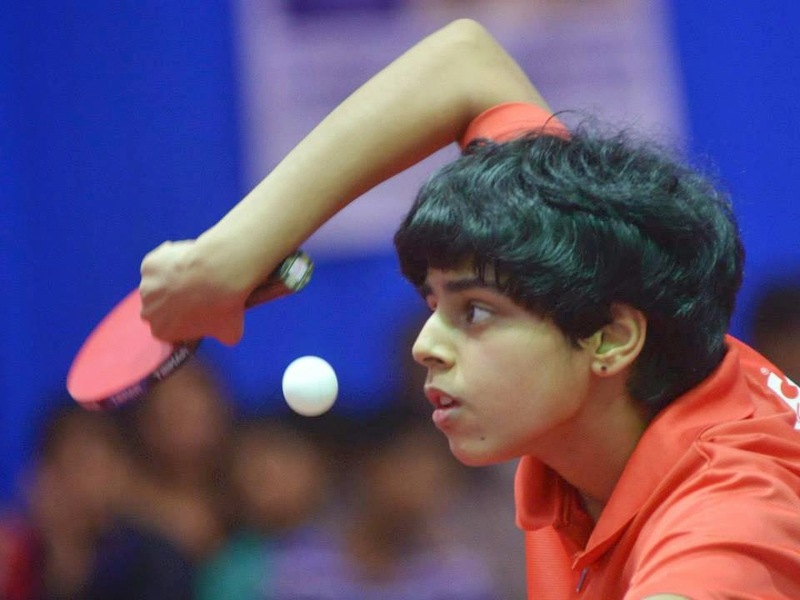 Archana Kamath won the sub junior girls national title last year with her aggressive attacking style of play. 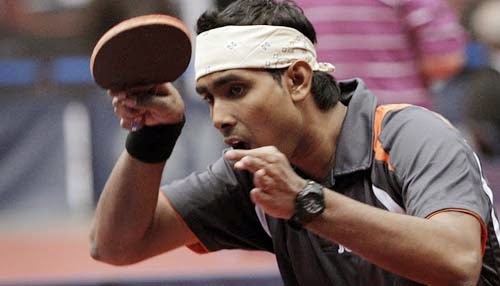 Indian Table Tennis ace Sharath Kamal is back to his highest ever ranking and is in the top 40 elite player list in the World. This is a good sign as he prepares for the Commonwealth and the World Championships. One of his top opponents will be Paul Drinkhall, who recently won the Spanish Open. Sharath is at it again! Flying the tricolour high at the Asia Cup Table Tennis tournament, he managed one of the best wins in his illustrious career beating World No. 8 Chuang Chih-Yuan (TPE) 11-3, 3-11, 11-6, 3-11, 11-4, 11-8! Earlier, he topped his group and beat Kim Hyok Bong, who is a strong player. In the end, only World No. 3 Fan Zhendong could stop his tremendous run! Harmeet plays the finals of the prestigious Qatar Open at 5:15 PM IST. Please cheer him up! After beating second Cheng Feng of Singapore in a close encounter in the very first round, Harmeet is functioning like the second seed winning against strong opponents in straight sets! (Angles Enzo and Hugo Calderano). He now faces the daunting task of trying to beat Tristan Flore of France, who is another player in form. 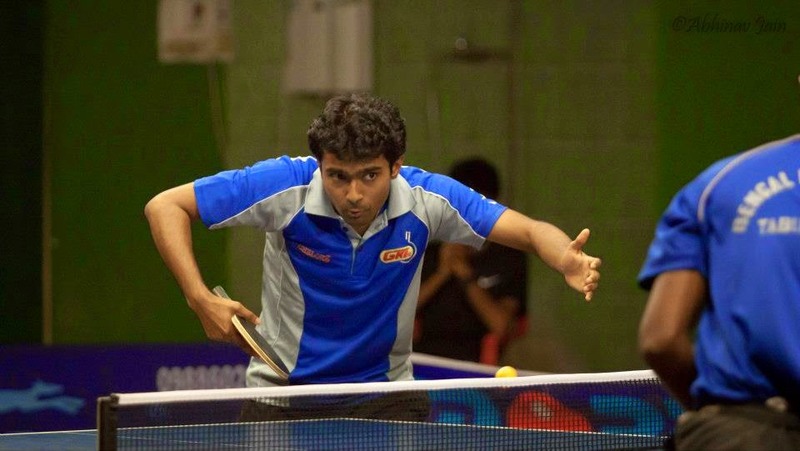 One of the positive aspects of India's rise in World TT is Sharath, Sanil, Soumyajit, Amalraj's performances and also Harmeet and Soumyajit working as a team. Even after losing to Calderano, Soumyajit provided tips to Harmeet, who promptly beat the Brazilian opponent. He just won't stop! Harmeet's next big victim is Cheng Feng (U 21 section) at the Qatar Open Table Tennis tournament in which the Men's top seed is Ma Long. Harmeet beat the 2nd seed Cheng in the very first round 6-11, 11-5, 11-9, 3-11, 11-5. Both Harmeet and Soumyajit will play in the Quarter finals.